Daily from 11:00 am to 5:30 pm. After hours tastings available by advance appointment. Established in 1998, Elizabeth Spencer is a winery based in Rutherford, Napa Valley. Proprietors Elizabeth Pressler and Spencer Graham, a husband-wife winemaking partnership, have forged strong long-term relationships with some of the most well-respected grape growers in Napa Valley, Sonoma Coast and Mendocino County and purchase fruit from the same premier vineyards from vintage to vintage. Working closely with these vineyard partners, they have established mutual high standards in grape farming practices and have maintained the highest level of quality and consistency. Elizabeth Spencer holds a firm belief that the best wine is made by focusing on the absolute pursuit of growing superior grapes. We uphold the philosophy of “meticulous minimalism” or that “less is more” when making wine. 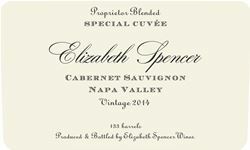 Elizabeth Spencer wines are vinified in small individual lots using classical hands-on methods. The results are delicious, balanced and approachable wines with great purity of flavor. Weather permitting, families may sit outside and enjoy our Courtyard. During winter months visitors may enjoy their tasting in our newly renovated Studio. The Elizabeth Spencer Tasting Room is located at 1165 Rutherford Road (Highway 128) in Rutherford, Napa Valley and is open every day from 11:00 am until 5:300 pm for tastings and retail sales. Reservations are recommended. Private Tastings, Wine and Cheese Pairings, Appellation Tastings and reservations for outdoor tables can be made by prior appointment. Wine Education: Opportunity to taste many different varietals, grown in different regions. Food Available: Cheese and charcuterie, boxed lunch, or full catered lunches are available with advance notice. To join the wine club, visit www.elizabethspencerwinery.com or call 707-963-4762. Charter Club: Each shipment features one bottle of red and one bottle of white wine. Red Club: Each shipment features a selection of two different red wines. Cuvée Club: Each quarter, members select the wines of their choice using our online store, with a total value of $500. One complimentary Charter Tasting with each one-bottle purchase. 10% savings on full or mixed case purchases of current releases.